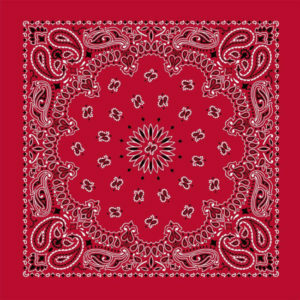 Getting that soft touch on a bandana print is easy if you’re doing water based printing on bandanas. 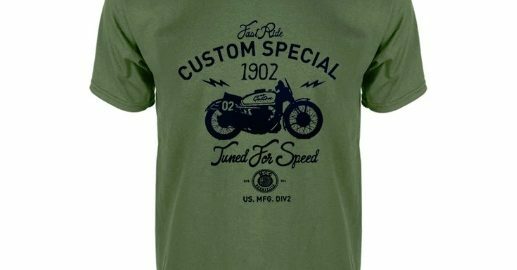 What many people don’t realize is that there are different types of inks that you can use for screen printing that will achieve different results. For ease of use and low cost, plastisol inks tend to dominate screen printing, but that’s far from the only option. 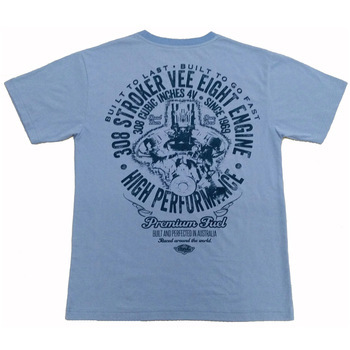 The drawbacks of printing with plastisol inks are that it dries stiff and can weigh down a lightweight fabric, especially one that has a lot of print coverage. Water based printing uses a thinner ink that can penetrate deeper and leave a softer hand which is why we at AMBRO Manufacturing use it for customizing fantastic bandanas. 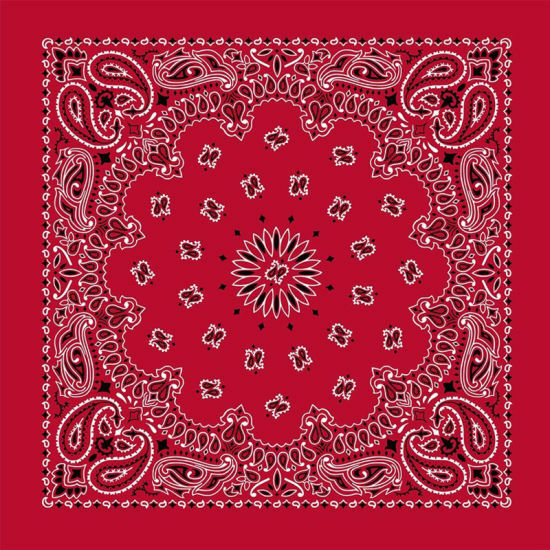 As custom bandana printers, we use only the best materials to produce our custom bandanas. Water based inks contain a solvent, which is typically water, and that makes them more fluid which helps the ink penetrate more deeply into the surface. You are left with a much softer print to the touch and on something as light and delicate as a bandana you can really feel a difference. 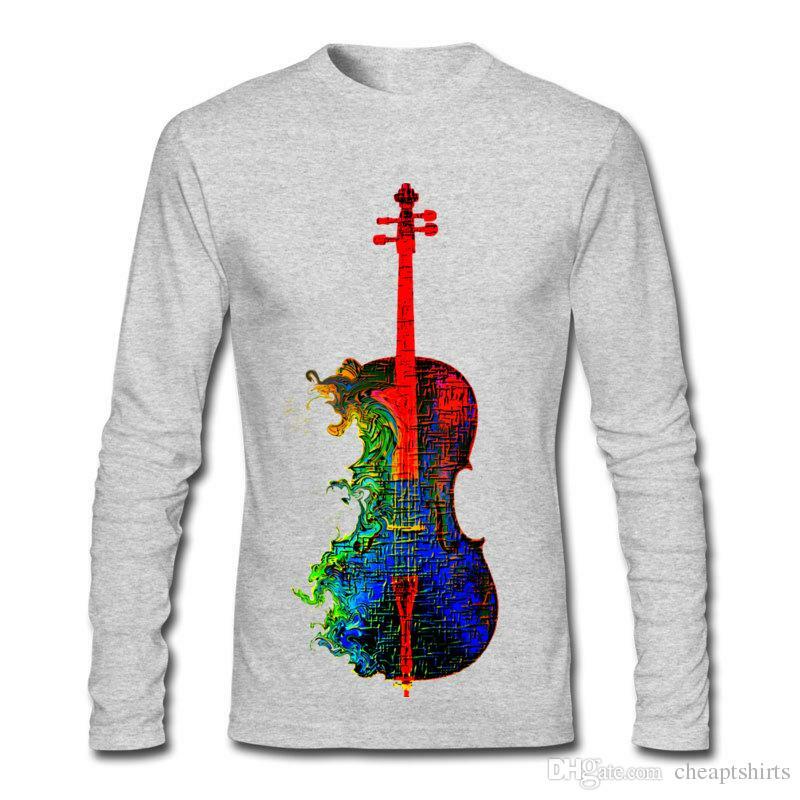 You won’t need to sacrifice any color vibrancy either because you can print in just as many colors as you would be able to with plastisol inks. We can even mix in a discharge agent into the ink so that you can remove the existing color from the garment while depositing the desired ink color in its place all in one step! So if you are interested in seeing what you can do with water based printing on bandanas then you should check us out at AMBRO Manufacturing. We make it easy to start a project because you only need to reach out to one of our representatives and we’ll be happy to show you how to proceed. You can contact us to place an order or to find out more about our company and all of the customization services we have to offer, by email or by giving us a call at (908) 806-8337. If you’re searching for custom contract printing on apparel then you’ve arrived at the right destination because AMBRO Manufacturing has what you’re looking for. AMBRO Manufacturing handles contract printing on apparel and we’ve been going strong for over 30 years now. If you want high quality, professional printing done then you can find it right here! We provide our services to a large range of customers with all kinds of printing needs, so there’s sure to be a space for you too. It’s hard to say what the best part about working with AMBRO Manufacturing for contract printing on apparel is because it could be that we offer a wide variety of customization services all under one roof. Since we’ve been in business for so long we’ve had plenty of time to establish the proper setups for so many different methods like oversized printing, water based and discharge ink printing, foil printing, scented printing, embroidery, knitting, transfers, and even more. Of course, it could also be that we offer our services remotely which makes contract printing on apparel as easy as can be. You can quickly coordinate an order over the phone or through email and we’ll ship the completed goods right to you. It’s easy to get your first project started here with us because you only need to reach out to one of our representatives and we’ll gladly get you set up. Our support staff is here to assist you during the process and we handle our production here in our own facility, so you can rest assured knowing you’ll receive the best possible results. If you are interested in placing an order with us, or if you would like to learn more about our company and all of the customization options we can offer, you can contact us by email or by giving us a call at (908) 806-8337. If you want to add a touch of class to your apparel you can do your own custom embroidered clothes! If you think embroidered clothes are a relic of the past then you need to update your perception because it’s just as modern as printing is! Just think of how many retail hats feature luxurious embroidery and you’ll start to get the picture. Embroidery is a great customization option because it looks more upscale than a flat print might look, so you can really add some retail value to your items. If you want to make embroidered clothes then you needn’t look further because AMBRO Manufacturing is here to help you. 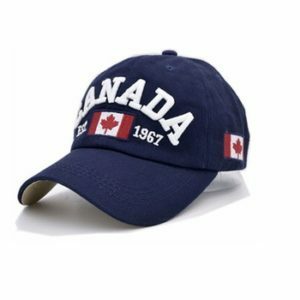 AMBRO Manufacturing is a contract apparel customization company with over 30 years in business so we have all the equipment you’ll need to do excellent embroidered clothes and so much more. We have decades of industry experience and loads of customization services to offer all under one roof so it’s easy to create custom looks for any purpose. Even if you’re brand new to making custom embroidered clothes we can still assist you so that you’ll be able to achieve your vision. It’s easy to get a project started with us at AMBRO Manufacturing as all you need to do is reach out to one of our representatives and we’ll be happy to show you the way. We do all of our production right here in-house to ensure excellent quality control on every project we handle, so you can rely on us to deliver top notch results. So if you are ready to make custom embroidered clothes today, or if you would like to learn more about our company and all of the customization services we have to offer you, you can easily contact us by email or by giving us a call at (908) 806-8337. If you’re tired of searching through different custom contract printers trying to find the right one for you, you should check us out at AMBRO Manufacturing. Here at AMBRO Manufacturing we handle a wide variety of customization services which makes creating your custom garments a snap. We have over 30 years in business so we have the expertise you want from top notch custom contract printer, which means you can certainly rely on us to deliver professional results. If you are a retail garment designer you probably have worked with custom contract printers before, but here at AMBRO Manufacturing we offer all of our services in one convenient place. It’s easy to design a line of unique looks when you have so many options at your fingertips. We’ve been around for a while so we’ve had all the time we need to set up many different decoration methods like oversized printing, scented printing, foil printing, glitter printing, water based and discharge ink printing, embroidery, and still even more. With so much to choose from you can create designs for any purpose or occasion. We can’t speak for other custom contract printers but here at AMBRO Manufacturing we do our production in-house which enables us to maintain superior quality control from start to finish on every job we handle. You can even coordinate your orders over the phone or through the internet without needing to step foot into the facility and we’ll ship the completed goods right to you. So if you are interested in working with us at AMBRO Manufacturing for your custom contract printing work, or if you would like to learn more about our company and all of the customization services we have to offer, you can contact us by email or by giving us a call at (908) 806-8337. If you want to blow the opposing team out of the water when you show up at your next swim meet, you should create your own custom swim team T shirts. It’s easier than you think and with our help at AMBRO Manufacturing you’ll be able to do it in no time at all. 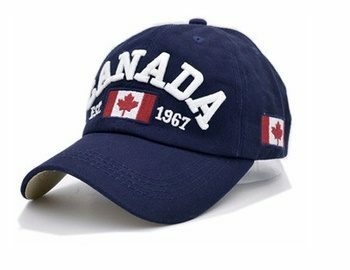 AMBRO Manufacturing is a contract apparel customization company with over 3 decades in business which means we have the expertise you want from a professional provider. We have everything you’ll need to make custom sim team T shirts and so much more. One of the best reasons to come to AMBRO Manufacturing to get your customized apparel is because we work with customers of all different levels. 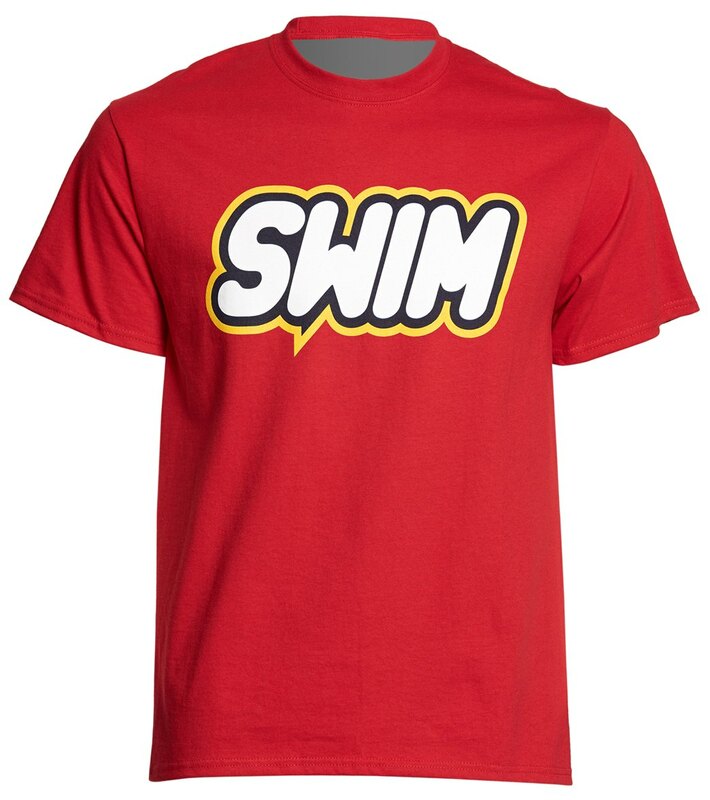 If you need custom swim team T shirts just for your own team you’ll receive the same service as a customer ordering for an entire league of swim teams, so you can rely on us to deliver. We offer a wide variety of customization services in one place so that you can create truly unique designs for virtually any purpose or occasion. We do all of our production right here in-house too which means we can maintain superior quality control from start to finish on every job we handle. It’s easy to get your own projects started here at AMBRO Manufacturing because all you need to do is reach out to one of our representatives and we’ll be happy to show you the way. You don’t even need to step foot in the facility either because we can coordinate the entire order over the phone or through the internet. So if you are ready to start creating custom swim team T shirts, or if you would like to learn more about our company and all of the customization services we have to offer, you can contact us by email or by giving us a call at (908) 806-8337. What’s cooler in the cold weather than beanies? How about customized beanies that you’ve designed? It’s not just some out-of-reach dream that you can’t have because we here at AMBRO Manufacturing have just what you need to make customized beanies and so much more. We are a contract apparel customization company with over 3 decades in business so we have the resources and the expertise to provide you with top notch garment decoration services. You don’t need to have any experience in making customized beanies to be able to create your own with us, so don’t be shy and see what you can do with our help! So let’s jump right into the customization and what that entails for beanies. At AMBRO Manufacturing we do all of our production right here on-site to ensure excellent quality control from start to finish and that means we even have our own knitting machines to work with. 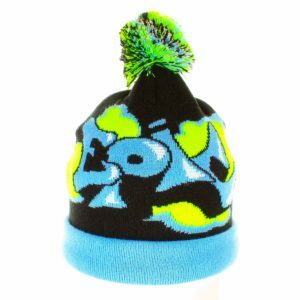 With our capabilities you can create knit-in designs on your beanies instead of decorating them after they’ve been made. You won’t have to worry about cracking prints or inflexible embroidery patches because your design will be a part of the knit itself. We have many colored yarns to work with to create the perfect look for your customized beanies, so you’ll be able to make your beanies fit for any occasion you could want them for. How do you get started on your very own customized beanies? It’s simple because all you have to do is reach out to one of our representatives and we’ll be happy to show you how. Our support staff is here every step of the way so don’t feel shy or overwhelmed because we can guide you to success. If you are interested in placing an order for customized beanies, or if you would like to learn more about our company and all of the customization services we have to offer, you can contact us by email or by giving us a call at (908) 806-8337. 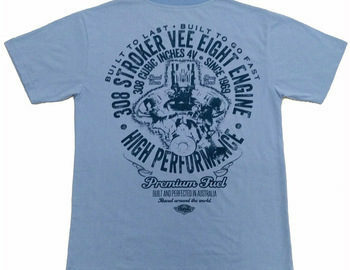 If you’re looking to start custom foil T-shirt printing then you should check us out at AMBRO Manufacturing. AMBRO Manufacturing is a contract apparel customization company with over 30 years in business so you know you can trust us to deliver high quality results. We offer many different decoration services in one convenient place so it’s a breeze to create an entire line of customized garments for any occasion. 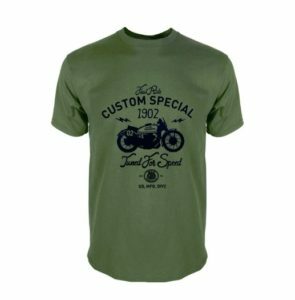 If you’re ready to see what you can do with your custom foil T-shirt printing here at AMBRO Manufacturing, you can get started right away! Foil printing is fun and it’s certain to call attention to itself on any garment. You don’t need much foil to give your designs a touch of sparkle, but you don’t have to be modest about it either. You can do full foil prints with your designs so that every inch of your image is covered in gorgeous foil. 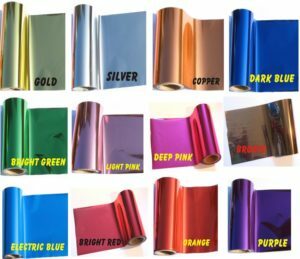 There are tons of different types of foil that come in every color of the rainbow with all different patterns so the possibilities are boundless. You can use custom foil t-shirt printing in your next promotional event or for awesome personal fashion looks, the choice is yours! It’s easy to get the ball rolling on your first project with us as all you have to do is reach out to one of our representatives and we’ll be happy to show you the way. Our support staff always keeps open lines of communication so that you can ask questions and receive assistance whenever necessary so don’t feel shy or overwhelmed because we’re here to help. You can easily contact us to place an order for custom foil T-shirt printing, or to find out more about our company and the services we offer, by email or by giving us a call at (908) 806-8337. Making custom logo bandanas is a whole lot easier if you’re working with the right printing company. Luckily for you, you won’t need to search any further to find the right company because AMBRO Manufacturing is here to answer the call. AMBRO Manufacturing is a contract apparel customization company so we have a large variety of services for you to utilize to customize many different garments and accessories. We can easily help you make custom logo bandanas that will be perfect for virtually any occasion, so if you’re ready to get started today then so are we! Even if you don’t know the first thing about making your own custom logo bandanas, we have the support staff here to assist you. We’ve been in business for over 30 years now so we know exactly what we’re doing! Not only do we have the expertise to ensure you get high quality results, we also can provide you with different print options for your bandanas. We can provide full edge to edge bandana printing in both silk screen printing and dye sublimation so the possibilities are limitless. Even photographic prints are a piece of cake, so don’t be shy with your designs. Best of all, we make it so easy to create and receive your custom logo bandanas that you won’t even need to leave your house to get them. We can coordinate the entire order over the phone or through the internet and deliver them right to you. We do all of our production right here in-house to ensure excellent quality control, so you can rely on us to provide top notch work each and every time. If you would like to place an order with us, or if you would like to learn more about our company and all of the customization services we have to offer, you can contact us by email or by giving us a call at (908) 806-8337. 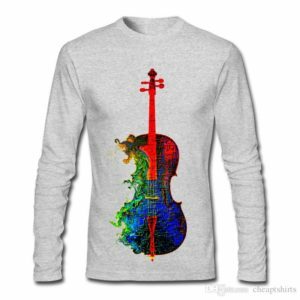 If you’ve ever worn clothes then you’ve probably dealt with custom printed clothes before. The thing is, not every print is the same and if you want to create your own designs you’ll need to know what kind of printing you’d like to do. Don’t worry though, because AMBRO Manufacturing is here to help you figure it out. We even offer water based printing services here that will let you get ultra-soft prints in vibrant colors, so if you want to do the very best custom printing you should come check us out. If you’ve never heard of water based printing services before, it’s a type of screen printing where you use inks that contain a solvent, which is typically water, and that allows the print to penetrate deeper and feel softer to the touch. Water based printing services make it easier to print all over designs on garments because the ink can pass over the seams and the lightweight nature of the ink means you won’t be weighed down like with plastisol screen printing inks. You won’t have to sacrifice quality or color when working with water based printing services, so it’s ever increasing in popularity as more people find out the benefits. If you are interested in trying out our water based printing services here at AMBRO Manufacturing we’d be happy to get you started any time. All you have to do is reach out to one of our representatives and we’ll happily show you the way. So whenever you are ready to place an order with us, or if you would like to learn more about our company and all of the customization services we have here to offer you, you can easily contact us by email or by giving us a call at (908) 806-8337.